Acute Myeloid Leukemia (AML) is an aggressive form of leukemia that is characterized by the proliferation of immature blood forming cancer cells, called blasts or leukemic blasts. These immature blasts do not mature into normal functioning blood cells such as red blood cells, white blood cells or platelets and they overcrowd the bone marrow prohibiting the production of mature, normal functioning blood cells. Left untreated, AML can progress rapidly. AML predominately effects people over the 60 years of age with the median age at diagnosis being 68 year of age. Both of Actinium's clinical products, Iomab-B and Actimab-A, are intended to treat patients with AML above the ages of 55 and 60, respectively. Bone Marrow Transplant is a $1.3 billion per year market in the US based on 2007 data. In the US, over the period from 2004 - 2007 (most recent available data) it was the hospital procedure with fastest growing number of hospital stays (51.3% growth, 15,100 hospital stays in 2007) and aggregate cost growth (84.9% growth, $1.3 BN in 2007). The cost increase is mostly due to the increase in the number of procedures (the majority of the 84.9% cost growth) and to a smaller extent, the increase in mean cost of hospital stay (25.6% contributor to the 84.9% cost growth) (Healthcare Cost and Utilization Project, December 2009, US Government Agency for Healthcare Research and Quality). In 2014, about 20,000 BMTs were performed in the US. Approximately 12,000 were autologous and approximately 8,000 were allogeneic. 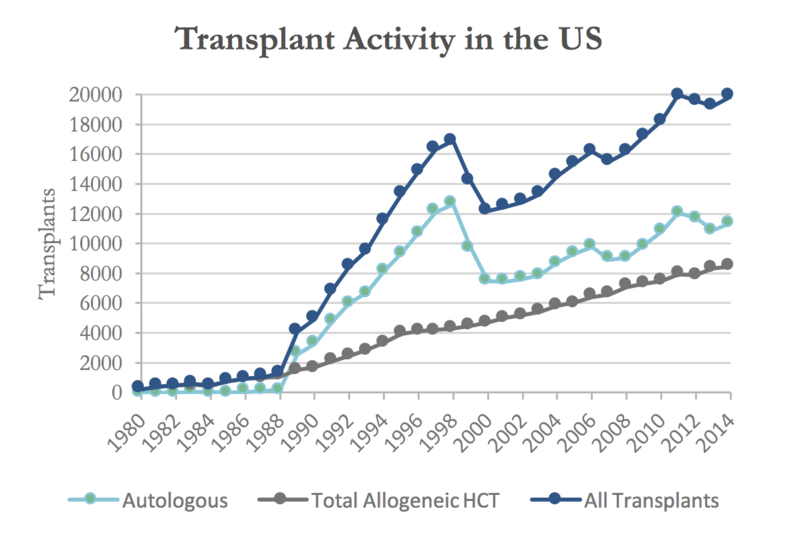 Worldwide, an estimated 60,000 BMTs are performed annually with approximately 34,000 autologous and 26,000 allogeneic (Current Uses and Outcomes of Hematopoietic Stem Cell Transplantation 2010, Center for International Blood & Bone Marrow Transplant Research). The number of patients over the age of 50 that receive a BMT has been steadily increasing over the last decade and based on the latest available data grew from 8% in 2000 to 21% in 2005 and 27% in 2007 (Biology of Blood and Marrow Transplantation Volume 14, Issue 9, September 2008). Multiple myeloma is a blood cancer characterized by malignant transformation of a type of white blood cells called plasmocytes. These cells accumulate in the bone marrow and eventually lead to serious bone and kidney damage. Multiple myeloma is the second most commonly diagnosed blood cancer after Non-Hodgkin Lymphoma with an estimated 30,000 new cases per year in the U.S. Almost 100,000 people in the U.S. currently live with the disease. The average age at diagnosis is 70 and only 2% of cases occur in people younger than 40 years. There is currently no cure for Multiple Myeloma, although a number of drugs have been approved for treatment of the disease. However, most patients eventually stop responding to available treatments, which results in a high unmet medical need for relapsed and refractory forms of the disease.